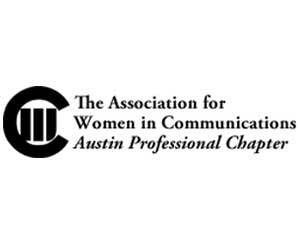 The Austin professional chapter of The Association for Women in Communications (AWC Austin) has nearly 200 members in fields such as marketing, corporate communications, graphic design, public relations, journalism, Web development, advertising and event planning. Our members work for Fortune 500 companies, agencies, non-profit organizations, associations, government organizations and themselves. AWC Austin is a chapter of The Association for Women in Communications, a national professional organization that champions the advancement of women across all communications disciplines by recognizing excellence, promoting leadership and positioning its members at the forefront of the evolving communications era. Since 1989, AWC Austin has supported more than 30 students in Central Texas with our Jo Caldwell Meyer Scholarship. Because of generous donations, for the last few years we have been able to award two $3,500 scholarships at annual Banner Brunch awards. Scholarship funds may apply toward a recipient’s tuition, books or other academic needs. Applicants must be a full-time sophomore or junior at a Central Texas university demonstrating excellence in the study of communications.